HG's BIG Guide to Coffee-Shop Swaps! The Coffee - When making iced or blended coffee-based drinks, we like to use instant coffee granules. 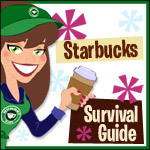 You can get all fancy and use Starbucks VIA; you can use the affordable-and-dependable kind from Folgers. Or you can brew up your coffee of choice -- just make it super-strong (with less water) if you plan to add ice afterward! The Milk or Creamer - If you're looking to put together a latte-like beverage with very few calories, you need Unsweetened Vanilla Almond Breeze. Light vanilla soymilk is good too, but UVAB is super-creamy and WAY low in calories! Sugar-free or fat-free powdered creamers, like the kinds by Coffee-mate, are also essential. When it comes to these creamers, the MVP (most valuable powder) at the HG HQ is sugar-free French vanilla. We keep the fat-free plain variety around as well, along with a fancy flavor or two! The Sweet Stuff - Splenda has been our go-to no-calorie sweetener for ages, but Truvia is our recent love and stevia pick. Torani Sugar Free Syrups are perfect when you want fun flavor + sweetness, without a bunch of calories! These syrups come in a SLEW of great flavors -- order them online or find them at places like Cost Plus World Market and BevMo!. If you're lucky, you can locate a couple of flavors in the coffee aisle of your supermarket... Just make sure they're the zero-calorie, sugar-free kinds! The Add-Ins - If you want to add some chocolate flavor to your brew, a bit of unsweetened cocoa powder will do it for minimal calories -- not to mention that a container of the basic stuff is cheap and will last a LONG time. If you want chocolatey stuff that IS sweetened, grab some 25-calorie hot cocoa mix packets -- Swiss Miss Diet is a staple. Finally, we have Fat Free Reddi-wip. Don't look at us like a squirt of whipped topping won't make your coffee drink more delicious. You know it will, and it'll get the job done for 5 calories per 2-tbsp. serving! Swap those treats you'd get with your cup o' joe for something you can grab at the grocery store! Want a Muffin? Vitalicious VitaTops! If sweet baked goods are your downfall, you need to get better acquainted with these 100-calorie (or less) treats. You can find limited varieties at select markets, and you can order from the whole lineup online. Keep an eye on your HG emails for free-shipping specials and other deals... There's one coming your way NEXT week! Hungry for a Hot B-fast Sandwich? Jimmy Dean Delights! Jimmy D. has some AMAZING options in this low-calorie lineup. Tasty items on an English muffin, a bagel, a croissant... WOW! And you don't have to wait in a line to get one. Craving Bagels? Thomas' Bagel Thins! Only Have Eyes for Oatmeal? Amy's Organic Hot Cereal Steel-Cut Oats Bowl! The Big Coffee-Shop-Swap Recipe Roundup! 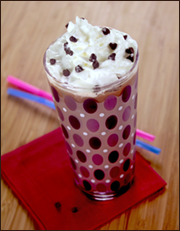 Cherry Bomb Iced Mocha - A fruity, chocolate-inflected coffee drink. We never get tired of it! Toffee Mocha Hotté - Just thinking about this sweet cup of yum makes us feel ready to face the day. Vanillalicious Cafe Freeze - Sure, the flavors are simple and it's easy to make, but your taste buds won't appreciate this sipper any less! Raspberry Mocha Madness Swappuccino - Frappuccino schmappuccino -- this rich-n-fruity freeze ROCKS! 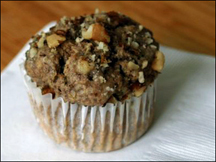 Fluffy-Good Zucchini Nut Muffins - Most veggie-based baked sweets are bad news; ours are front-page worthy. Big Fat Blueberry Muffins - Everybody's favorite muffin, featuring surprisingly slim stats. Chocolate-Chippy Cheese Danish - Guilt-free pastry with chocolate. We repeat, GUILT-FREE PASTRY WITH CHOCOLATE. Crazy-Delicious Cheesy Cherry Danish - If chocolate isn't your style (don't scoff, cocoa lovers -- some people aren't into it! ), this fruit-filled Danish will suit your needs. Skip grabbing coffee with your homies -- click "Send to a Friend" to pass this along, and then you can all get together for java at home!